Steingraeber & Söhne produces high-end quality only. This is proven by the Chamber of Handicrafts for Bayreuth/Upper Franconia, in cooperation with national body the German Confederation of Skilled Crafts (Zentralverband des Deutschen Handwerks – ZDH) with a particularly demanding ‘Seal of Quality’. It is awarded upon successful completion of the most stringent certification tests for manufacturing processes in the country. and in addition that at least 80 percent of the processing of these raw materials takes place within Germany itself. This certificate is also available for other manufacturers. 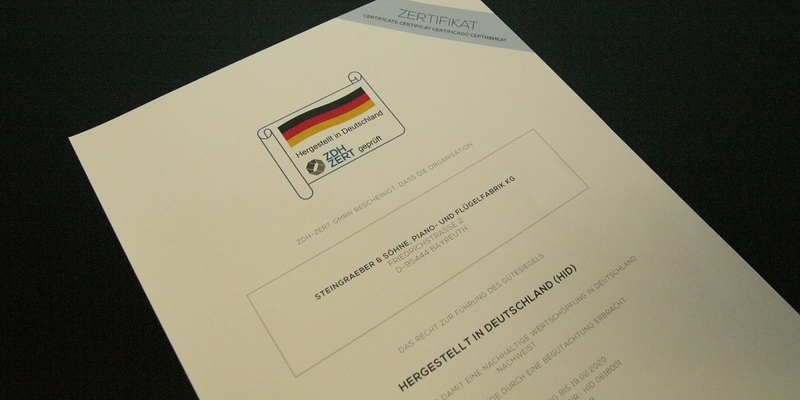 If a firm can demonstrate and ensure that at least 80 percent of the materials used in its production processes originate from Germany, and likewise that 80 percent of the production work actually takes place in Germany, then it will be awarded a ‘Seal of Quality’. ‘The benchmark of 80 percent was chosen to enable other types of businesses to apply. The initiative for its development came from piano manufacturers Steingraeber & Söhne in Bayreuth. 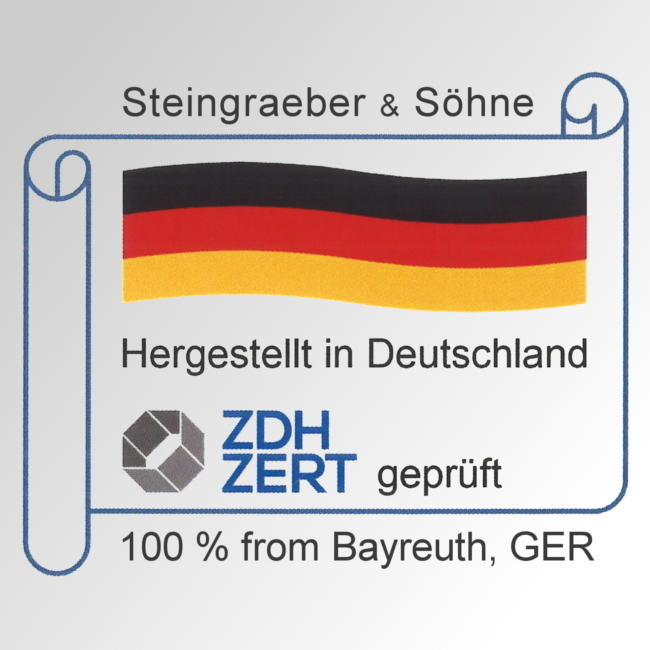 Conventional seals of quality, such as ‘Made in Germany’, were simply not demanding enough to reflect the aims and objectives of Company Director Udo Steingraeber, as they allow products to be described as ‘Made in Germany’ even though only 50 percent of the manufacturing process might take place within the county, often without first-class, German-made component parts. Klaus Kainath, head of the certification procedure, carried out the evaluation personally at Steingraeber and describes the process: “I spoke to employees and inspected delivery documents, and was able to determine that Steingraeber manufactures 100 percent in Bayreuth using, almost exclusively, German materials.” Piano manufacturers Steingraeber & Söhne can now provide, signed and sealed, further proof of their own highest standards to customers worldwide with the newly awarded certificate: ‘Manufactured in Germany HID 0618001’. 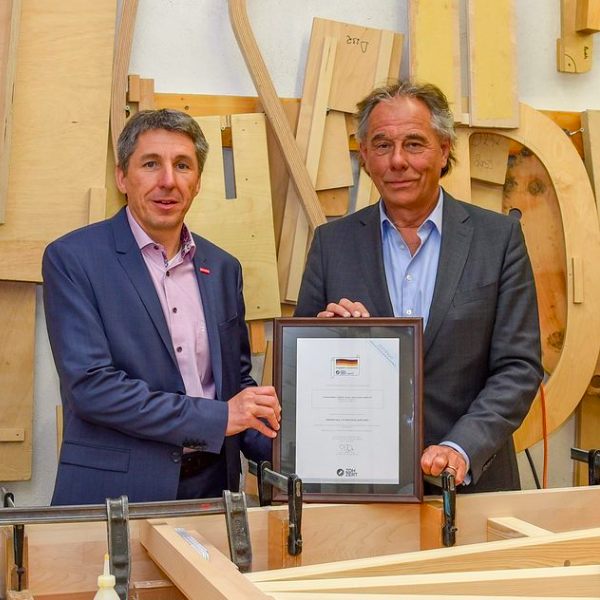 Caption: Presentation of the ‘Manufactured in Germany’ certificate, at Steingraeber Piano Manufacturers. From left to right: Rainer Beck, Director of the Chamber of Handicrafts (KdH), and Udo Schmidt-Steingraeber. Photo: Stefan Dörfler.